Apple today announced financial results for the first calendar quarter of 2013 and second fiscal quarter of 2013. For the quarter, Apple posted revenue of $43.6 billion and net quarterly profit of $9.5 billion, or $10.09 per diluted share, compared to revenue of $39.2 billion and net quarterly profit of $11.6 billion, or $12.30 per diluted share in the year-ago quarter. Gross margin for the quarter was 37.5 percent compared to 47.4 percent in the year-ago quarter, with international sales accounting for 66 percent of revenue. Apple also declared a increased dividend payment of $3.05 per share, payable on May 16 to shareholders as of the close of trading on May 13. The company currently holds $145 billion in cash and marketable securities. In addition to the increase in the dividend payment, Apple said it will dramatically increase its share repurchase authorization to $60 billion from $10 billion. The company says it expects to spend $100 billion in cash under its capital return program by the end of 2015. Apple is now paying $11 billion per year in dividends to shareholders. Quarterly iPhone unit sales reached 37.4 million, compared to 35.1 million in the year-ago quarter, and the company sold 19.5 million iPads, up from 11.8 million in the year-ago quarter. Apple sold just under 4 million Macs compared to 4 million in the year-ago period. Apple's guidance for the third quarter of fiscal 2013 includes expected revenue of $33.5-35.5 billion and gross margin between 36 and 37 percent. Apple will provide live streaming of its Q1 2013 financial results conference call at 2:00 PM Pacific, and MacRumors will update this story with coverage of the conference call highlights. Apple's stock price is trading up more than five percent after hours as the market reacts to the earnings news. - "A lot of news to share with you today" regarding March quarter and capital return program. - Halfway through fiscal 2013 year, introduced and ramped production of unprecedented number of new products. - Revenue was more than $98 billion, net income more than $22 billion. - 85 million iPhones, 42 million iPads. Unimaginable to us a few years ago. - Beat our guidance but didn't meet everyone's expectations. - Achieved incredible scale and financial success. Margins have decreased and growth has slowed. - Revenues grew $13 billion in first half of the year. Average weekly growth slowed to 19%. Gross margins closer to levels from a few years ago. - Year over year comparisons difficult because of incredible 2012. - iPad Mini pushed margins down. - Guiding to same revenue but decline in margins. - Decline in stock price has been frustrating, but Apple remains strong and we will continue to do what we do best. Can't control exchange rates and world economies and certain cost pressures. - Most important objective is to create innovative products. - Continue to focus on the long term, remain very optimistic in our future. - Participating in large and growing markets, see lots of promise in front of us. - Potential of exciting new product categories. - Smartphone market will double between 2012 and 2016, to 1.4 billion units annually. Tablets growing even faster. - Amazing new hardware, software and services coming this fall and throughout 2014. - Strongest ecosystem in the industry. - Highest loyalty and customer satisfaction rates in the industry. - Focus on the world's best products that change people's lives. - Same company that brought the iPhone and iPad, and have a lot more surprises in the works. - Returned $10 billion under share repurchase and dividend payments. - Continue to generate cash in excess of our needs. - Firmly committed to attractive returns to shareholders through business growth and return of capital. - Return $100 billion by the end of calendar 2015. - Concluded that investing in Apple was the best option. - Increasing dividend by 15%, will access the debt markets. - Appreciate input from so many shareholders. Will evaluate yearly and will continue to invest in the business. - Disciplined but will not underinvest. 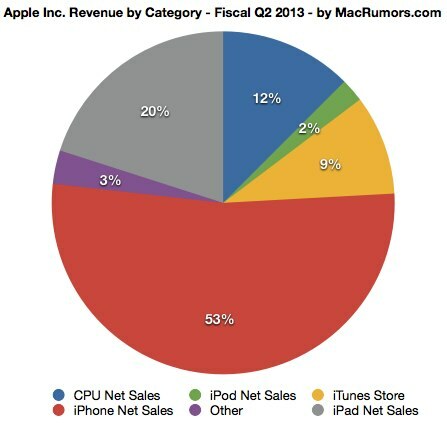 - New March quarter records for iPhone and iPad sales, new record for iTunes sales. - Strong growth in iPhone and iPad sales. - 37.4 million iPhones sold, up from 35.1 million y/y. 7% growth. 11.6 million in channel inventory, up 1 million sequentially. In target range of 4-6 weeks of inventory. #1 spot in U.S. smartphone market for 3-months ending in February. iPhone number 1 in Japan for all of calendar 2012 and Q4 2012. First time a non-Japanese company has achieved the number one spot for an entire year. - IDC says iPhone is number 1 or 2 in smartphone sales in half the countries IDC tracks. - 95% loyalty rate among iPhone owners, "substantially higher" than the competition. JD Power ranks iPhone top for 9 years in a row. - 30,000 companies distributing iOS apps for their employees. Cisco BYOD increased iPhones connecting to its network by 50%. - 19.5 million iPads versus 11.8 million y/y. Very strong growth in every operating segment, sales more than doubled in Greater China and Japan. iPad and iPad mini are extremely popular. Significantly more iPad minis sold this quarter. Overwhelming majority of iPad mini purchasers are first time iPad customers. - iPad mini is now in target range of 4-6 weeks of iPad channel inventory. - 96% of iPad customers are satisfied with their tablets. - Delighted by the number of companies using iPad, plus adoption of iPad in emerging countries. - Just under 4 million Macs. 2% down y/y. Global computer market contracted 14% y/y. Decline in portable sales, increase in iMac sales. - 4-5 weeks of Mac channel inventory. - 5.6 million iPods, iPod Touch accounts for more than half of iPods sold. iPod share of US market of MP3 players was more than 70% of market. - Apple ecosystem continues to grow and thrive. - Very important driver of customer satisfaction and retention. - Sunday marks 10th anniversary of iTunes Music Store. - Quarterly billings of $4 billion, a new record. $16 billion annual run rate. Largest digital content store in the world. - Music stores in 119 countries, 35 million songs, movies in 109 countries, iBookstore in 155 countries. App Store in 155 countries, covering 90% of world's population. 850,000 iOS apps, 350,000 apps for iPad. - App downloads passed 45 billion, app devs have made $9 billion total. - App Store accounted for 74% of all app sales worldwide in March quarter. - App Store accounted for 95% of Backflip Studio's annual $100 million in revenue. - iOS platform offers secure environment. - 97% of mobile malware on Android. - iPad accounted for 82% of all North American tablet traffic in March. - 800 apps downloaded per second in the quarter, y/y app revenue doubled. - 300 million people using iCloud. Great new features and capabilities in the pipeline. - $5.2 billion in retail, up 19%. Up because of iPhone and iPad sales. 402 stores, including 151 outside the US. Open 30 new stores in fiscal 2013, plus 20 store remodels. Average revenue per store $13.1 million vs $12.2 million y/y. 91 million visitors compared to 85 million y/y. 78,000 per store per week. - $144.7 billion in cash plus short and long term marketable securities. Up $7.6 billion. $102 billion is offshore. - $2.5 billion in dividends, concluded $1.95 billion accelerated share repurchase program. 4 million shares of Apple stock retired. - Doubling return of capital program to $100 billion by end of 2015. - Average of $30 billion per year. - Will access debt markets. - $60 billion in share buyback, largest of any company in history. Repurchasing shares is attractive use of capital. Buy shares beginning this month. Continue to net share settle employee RSU's. $1 billion of cash annually. - Quarterly dividend to $3.05/share from $2.65, up 15%. - Among the largest dividend payments in the world, roughly $11 billion per year. - Will access U.S. debt ratings over time. Generating significant cash offshore, repatriating cash would cause significant tax consequences. - Access to attractively priced capital, efficient leverage of our balance sheet. - Will maintain domestic liquidity. - $30 billion would have represented all of fiscal 2012 cash flow had we repatriated our foreign earnings. - Expect our foreign earnings and domestic borrowing to grow through 2015. - Aim to maintain flexibility to invest while we return capital. Q: Gross margin came in at low end of guidance, can you rank for us the biggest factors that are limiting margin recovery? A: March quarter, gross margin was 37.5% at low end of range. Had a few items that resulted in this: mix (more iPads and iPad mini into channel), changes in service policies, unfavorable adjustments. Guiding gross margin down 50 to 150 basis points sequentially. Largest reason is loss of leverage on sequentially lower revenue and a different product mix. Both of these will be partially offset by better costs in the quarter. Q: Growth slowed in China to single digits, curious your perspective given stickiness and the fact that Apple is not in the biggest carrier there. A: Greatest quarter for China ever, $8.8 billion including retail stores, up 11% year on year. Same as Apple's growth. Highlights included iPad growing 108% y/y, new records for sell through for iPad and iPhone. Significant y/y timing differences related to iPhone. Last year, increased channel inventories by 2.6 million. 1.6 of that occurred in Greater China. If you look on a sell through basis, Greater China was up approximately 18%. Going forward, we see a significant opportunity in China. It's a great market. Expect to double number of stores from 11 to 22 in less than 2 years. Added 8k iPhone point of sales to 19k. Have a plan to add more and further grow our distribution. This is too low currently. Innovating in our online store there, adding different functionality to the store. China has an unusually high number of first time smartphone buyers. We've seen significant interest in iPhone 4 there and recently made it even more affordable to make it more attractive to those first time buyers. Q: Competitive landscape in 2013 vs 2012? How has it surprised you? A: Smartphone market has always been competitive. The names have changed. In the beginning, RIM was the strongest player. Today, our top competitor is Samsung married to Google. They're tough competitors but we feel that we have the best products by far. Continuing to invest in innovative products and feel really confident about our product pipeline in both hardware, software and services. We have the best ecosystem by far, plan to keep making it better. That shows up in loyalty ratings and customer satisfaction. Q: How are you thinking about the pace of your buyback? What factors will you consider in purchase timing over next few years? A: Begin buying shares beginning this month. Utilize remaining $58 billion by end of 2015, spanning 32 months. Accelerated share repurchase and to buy in the open market. Q: You alluded to fall announcements. Does that mean there won't be big announcements before then or are you being more general? A: Don't want to be more specific, but we have some really great stuff coming in the fall and across all of 2014. Q: Talk about supply chain? Some concerns about product limitations, but getting huge relative to what you used to run. Talk about moving to new vendors? A: We exited March quarter with no shortages while achieving inventory turns over 90, still staggering for our industry. The December was largest quarter ever in history of Apple and tech industry. Included unprecedented number of new products and ramps. Work we do to produce truly innovative products is very hard. Challenges that we'll face in the future, but we're working very closely with our manufacturing partners and we are executing a very exciting roadmap. Q: Revisit gross margin, comment on experiencing normal kinds of experience curves that you do in typical product ramps, can you comment on sequential decline in iPhone ASP (down $30 sequentially)? A mix of 4 and 4S relative to the 5, but can you confirm? What's the impact on margin going forward? A: Very pleased with progress on getting cost curves down, help to offset loss of leverage and mix in next quarter, factored these cost improvements into our guidance. iPhone ASP is down sequentially because of mix. Increase in iPhone 4 mix, resulting from making iPhone 4 more affordable in many markets, also mix within iPhone 5 lineup. Q: How do we think about margins for iPhone 4 vs 5? A: We don't provide margins within product lines. Talked about two factors impacting gross margin on sequential basis. Leverage is largest reason for decline, but different product mix going forward on iPhone. As you get further from a previous product launch, there is a general lower mix within a line than where it starts. You'd expect to see that on most of our products. Q: You talked about excitement regarding large addressable markets. Talked about how strongly and confidently you feel about competitive advantage. If I step back and look at the data on the phone side, adjusted for inventory the iPhone was up low to mid single digits. Third party market data says market grew 30%. Next quarter, iPhone won't match the smartphone market growth overall. Is that a problem and is it something Apple cares about? What is the disconnect between market growth and your products? A: Tablet numbers that we've seen from IDC, believe market declined 30% from December. We declined 15%. If that holds, we did better than the market and a nice pickup in market share. On iPad, we continue to have an ecosystem story that is unparalleled. 350,000 apps for iPad, versus a few hundred for competition. Plus overall experience and fit and finish is better than options from competition. On phone side, the numbers you talk about, the sell-in comparisons y/y, you have to look at sell through to examine demand. We did grow channel inventory last year to catch up on iPhone 4S rollout. You have to factor that to get at sell through. If market grew by 30%, we grew less than that. The point is not lost, we do want to grow faster than the market. We don't view it as the only measure of our health. The things that are important to us in addition to market share and unit volume include customer sat (highest by far), customer loyalty and repurchase (highest by far), and ecosystem commerce which attracts developers is incredible. 3/4 dollars spent on apps are spent in our ecosystem. Usage statistics are staggering comparing iOS to other operating systems. These other things are extremely important and we're all about customer experience and enriching lives. That said, we see an enormous number of first time smartphone buyers coming to market particularly in certain countries around the world. What we've done there is to make the iPhone 4 even more affordable and more attractive to first time buyers. We are caught up on supply/demand on the 4 and we're continuing to do that in other markets. We believe that the phone for the price point that we're offering, is an incredible value for people that gets people into our ecosystem with a phenomenal product. Q: Comment on gross margin beyond next quarter? What does it say about long term gross margins if 36-37 is the margin when your highest margin product is at a trough for the year? I think that's what you're implying. Is there an implied margin philosophy where this is as low as you want it to get, or is this not what we should be reading? A: Been our long term practice that we aren't providing specific guidance beyond the June quarter. Many things that can affect margins and can cause them to vary widely over time. Don't want to make a forecast, but this is how we think about gross margin. Managing the business for long term. Willing to trade short term profits for long term potential. Launched iPod in 2001, margins were significantly below margins for Apple. 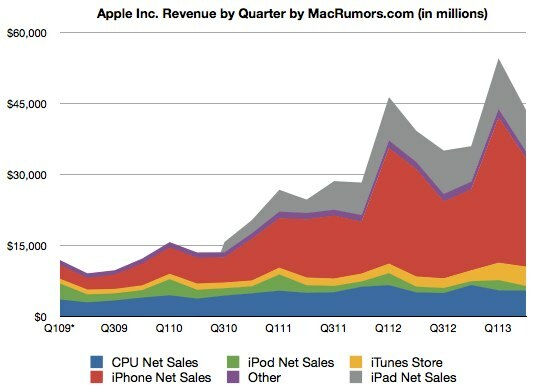 Later, iPod and iTunes comprised half of Apple's revenue. Inspired us to build the iPhone. iPad mini is similar, margins significantly below the corporate average. Only make great products. Won't make cheap ones. Many people around the world who want great products. Made great business decisions to balance unit sales and profit. Managing Apple with a long term horizon. Much revenue comes after we ship our products. Received $4 billion in revenue for services for the first time, will augment ecosystem with new services and make existing ones even better. Q: What is your reaction to what you think of the 5-inch phone market at this time versus 3 months ago. Has anything changed in your view? A: My view continues to be that iPhone 5 has the best display in the industry. We always strive to create the very best display. Some customers value large screen size. Others value other factors such as resolution, color quality, white balance, reflectivity, power consumption, compatibility of apps, portability. Our competitors have made some significant tradeoffs in many of these areas to ship a larger display. We would not ship a larger display iPhone while these tradeoffs exist. Q: Did you mention new product categories? A: One of our areas for growth are potential new categories. Q: Would that be in the next year? A: Didn't announce a specific time frame. Q: Mentioned new services and improving specific services, are there any other key access that you can leverage into new services? A: Very fortunate to have the largest and broadest ecosystem in the world. App stores in 155 countries and iTunes in more than 110 countries. Hundreds of millions of users. $16 billion run rate on iTunes Stores in billings, and $4 billion in revenue for services. Opportunity to invest in tremendously to continue to grow our businesses in those areas. Because we are not fragmented like our competition, we can update an OS with a major release and a substantial percentage of our customers will update to our latest software. We've made that elegant and easy. Because the usage for iOS is so much higher, when we integrate things well, people use them a lot more. So, just those concepts by themselves are huge advantages from a customer experience point of view and from the metrics that you're thinking about. Q: In terms of payments market, do you feel this is well addressed with the offerings out there? A: I think it's in its infancy. I think it's just getting started. Just out of the starting block. Q: What are you thinking of in the Mac market versus the PC market? Curious whether you think elasticity of demand with lower prices, what you're hearing from your customers, or how are you feeling about cannibalization potential? A: Reason that we were down last quarter (2%), market for PCs is incredibly weak. Market is down 14% y/y, largest decline that I can remember. We sold almost 20 million iPads, and its certainly true that some of those iPads cannibalized those Macs. I don't think it was a huge number but I think it's some. The larger thing here is that on the PC side people are extending their upgrade cycles. This market isn't a dead market or a bad market by any means. Has a lot of life to it, continue to innovate in it. If anything, the huge growth in tablets may wind up benefiting the Mac. It pushes people to think about that product in a different manner. People may be more willing to buy a Mac versus a PC. Will continue to make the best personal computers. Strategy isn't changing. Great innovation like the retina display, and more great stuff planned. Area we're continuing to invest in. Q: Competitors starting to talk about wins in the enterprise. I'm curious what you've heard from your customers, seen much displacement? What are discussions you're having with enterprise customers with regards to iPads? A: Seem to be doing really well. iOS accounting for 77% of activations by corporate customers according to one study. Would not include BlackBerry but would include the other guys. Seem to be doing really well, I don't see recent announcements changing that. More and more people developing custom apps for their businesses on iOS to be used on iPad, we're very bullish on it. iPad now is being used in 95% of Fortune 500, on Global 500, we're in 89%. Q: December quarter had broad product refresh. Did you learn that you should stagger those launches over multiple quarters instead of one quarter? A: I don't spend a lot of time looking back except to learn from it. If we could run it over, I'd announce the iMac after the turn of the year. We felt customers had to wait too long for that specific product. The iPad mini was in shortage in the December quarter, I would not have done that differently. We were able to get the mini out to millions of customers who really wanted that for the holiday. Yes, we did do a lot, our teams can do a lot. In retrospect, that one I wish we were after the turn of the year so customers wouldn't have to wait as long as they did. Q: Are you seeing acceleration in usage rates? A: We see incredible usage in every study we see. Vast majority coming not from Apple. Usage of iOS devices are staggering compared to competitors. A phenomenal difference. That shows the strength of the ecosystem. We are now paying our developers more than $1 billion per quarter. So much cash on hand. Why not spend more of it on R&D? Just spend more money, then things will go better. Can't wait to see how analysts are going to spin this into more doom and gloom. The lower stock price is a blessing for Apple. They can really snag a bucket of their stock back at 1/2 the price. I really hope their long term plan is to basically take the company private. The laws and reporting regulations are just a drag on the company. Aren't the independent analysts' prediction incredibly close to Apple's revenue? If anything, this proves MR is full of angry people who do not dare tolerate criticism of the mother ship. I posted this quarter I felt Apple should modestly increase dividends by a figure near its growth rate, which they did at 15% increase to $3.05 per share. I also felt they should aggressively increase the buy back which they did from $10B to $60B. This is a smart company. Buy APPL. Cash is $145B. That's almost HALF of the $381B market cap. Hope they aren't getting wet in there. Apple no longer bases warranty decisions solely on the moisture indicators. It's all good. But, but, but I thought they said Apple is doomed since they don't have a 10000000 inch iPhone or REAL innovation. Smh. Great job beating expectations, Apple. I can't wait until I hear these analysts response. They will flip it somehow. Samsung and Microsoft spend way more than Apple ever has on R&D. Perhaps you'd be more happy with their products?